The militant group Partido Manggagawa (PM) today expressed opposition to the imposition of martial law in Mindanao in the wake of armed confrontations between the Armed Forces of the Philippines and the so-called Maute group in Marawi City. 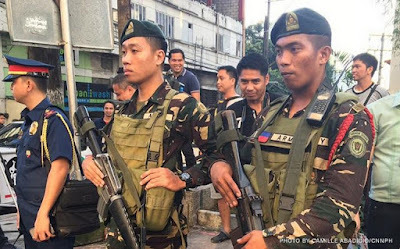 “Martial law in Mindanao is a disproportionate response to a localized problem. It is like using a gun to kill a fly when a swatter will suffice. The lessons of Philippine history is that martial rule is a problem not a solution as it leads to abuses and dictatorship,” stated Rene Magtubo, PM national chair. He added that martial law will affect the exercise of civil liberties and labor rights in Mindanao. “There have been several labor strikes in Mindanao since last year and also workers’ protest actions against contractualization. Under martial law, the military can be called to suppress such legitimate acts of redress workers’ grievances. It certainly won’t be the first time such happens,” Magtubo insisted. PM also called on Congress to revoke the declaration of martial in exercise its prerogatives to review the presidential order. The group has learned that the Congress leadership has informed solons to be on standby up to Friday. According to safeguards embedded in the Constitution, Congress has to affirm any declaration of martial law and may revoke it after 48 hours. The group further called on Congress to review the state of lawlessness imposed over the whole of the Philippines since September 3, 2016. “The state of lawlessness has not been lifted. The imposition of martial law on top of a declaration of state of lawlessness is an escalating threat to civil liberties, political freedoms and labor rights,” Magtubo averred.